The bay area's very own, San Francisco is one place we can say we're proud to serve. There are a great many different housing types in San Francisco, and we are up to the challenge to install a stairlift anywhere. Every technician from San Francisco will provide prompt, friendly, and neighborly service. They’ll be quick but thorough and leave no mess behind once the stairlift is installed. What Do You Know About San Francisco? 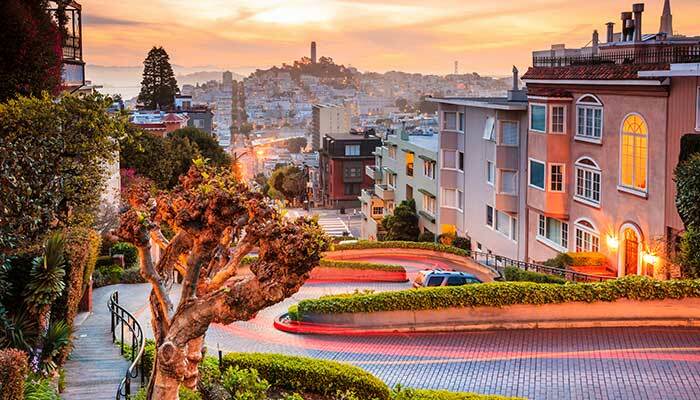 Known for its progressive social policies, gorgeous scenery, and diverse population, San Francisco is without a doubt one of the most famous cities in America. In the 1960s, San Francisco’s Haight-Ashbury District was ground zero for America’s “counter-cultural” movement, and as time passed, the city came to be known as one of the most tolerant in the country. Initially inhabited by a variety of Native American tribes, San Francisco was first settled by Spanish explorers in 1776. To convert the local natives to Christianity, the settlers decided to establish a mission named after St. Francis of Assisi in the area. Once the territory referred to as “The Bay Area” achieved independence from Spain, its ownership went to Mexico and later the United States after the former’s defeat in the Mexican-American War. During the Gold Rush, settlers from the East Coast arrived in record numbers, and after the war, the city was officially renamed San Francisco. San Francisco is a financial powerhouse, and for this reason, numerous industries have made the city their home. After New York City, San Francisco is the second largest banking center in the country, with banks such as Wells Fargo and Bank of America originating in the city. San Francisco is also just a short drive away from Silicon Valley and companies such as Facebook, HP, Intel, Apple, and eBay. Stanford University, one of the world’s most elite learning institutions, is located south of the city. The population of San Francisco is nearly 885,000, making it the 13th largest city in the United States, and its residents enjoy a very high standard of living – the 2017 GDP per capita was approximately $94,000. Due to its competitive housing market, numerous real estate investors flock to San Francisco each year. The city is also home to sports teams such as the Giants and 49ers. San Francisco is home to countless attractions, including numerous beaches, the infamous Alcatraz, the San Francisco Zoo, Chinatown, and Candlestick Point, which is the state’s first urban recreation area. Although the previously named attractions draw millions of visitors, San Francisco’s most popular attraction is the Golden Gate Bridge. Famous movies such as X-Men, Godzilla, San Andreas, and Superman have all featured destruction scenes involving the iconic Golden Gate Bridge.